Dinosaurs in the Wild, the brand-new multimillion-pound attraction on the Greenwich Peninsula, is 50% educational research trip, 50% immersive theatrical experience and 100% jaw dropping heart-racing fun. With its blend of animatronics, 3D video animation, detailed set design and live acting, Dinosaurs in the Wild creates an illusion as realistic as modern technology allows today. The narrative set up for this adventure is the story of a fictional Australian scientist, Professor James Buck, who in 1910 started working on a centrifugal time machine. His unique technology was then used to take researchers back millions of years to prehistoric times to study living dinosaurs in their natural habitat. Now in 2018, a company called Chronotex Enterprise is offering time travelling tourists – that’s you and me – leisure visits to Timebase 67, the scientific research station in the Late Cretaceous plains. What sounds kind of technical is actually rather fun: Chronotex tour guides, time travelling cabin crew so to speak, hand out 3D glasses and give you some basic safety instructions: don’t attract the dinosaurs’ attention, stay away from the windows, stay with your guide – but the survival rate is apparently “almost perfect”. And off you go, whisked into the time capsule that transports you shaking and rumbling into the Mesozoic Era. 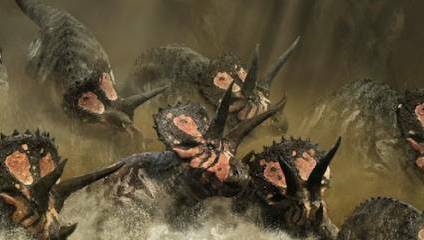 The experience starts with a bang, giving you some of the best visuals right at the start with magnificent creatures majestically pacing the plains, a herd of migrating triceratops and their babies and a rather agitated little raptor jumping and clawing at the window. The time capsule then rumbles into the safety of the Timebase building three storeys underground. In the Pathology Lab you can witness a deliciously gory autopsy, admire some oversized eyeballs in goo, a huge beating heart, surprisingly tiny T-Rex brains, stick your hands into dinosaur dung (containing some shredded bones of course), look at horrific bugs under a microscope and other gross-out activities that will have children screeching with delight. Lots of educational information is subtly woven in but it is difficult to concentrate on these facts with this much visual stimulation. And of course hearing the dinosaurs stomping right above your head, dangerously close, can be distracting. The tour continues on to the Hatchery where different types of dinosaur eggs are held in incubators and you can witness a tiny little slimy Dilophoraptor baby hatching. There is a dark room for nocturnal animals and an Animal Lab where you can watch recently hatched juvenile dinosaurs at feeding time. The realistic high-tech audiovisual effects and animatronics are stunning to watch for adults and the theatrical live-action is hugely entertaining and pulls you in. For young children who haven’t lost their sense of magic yet it must be completely astonishing. Even though some T-Rex activity had been monitored recently, your guide won’t want to deny you the highlight of the tour, the Lookout Platform where behind the safety of extra thick glass you can enjoy panoramic views of all the prehistoric animals around. Here things get rather violent and before too long you might long for the safety of good old 2018…. The experience is obviously aimed at children and although there is no age restriction the realistic visuals can get pretty scary at times and some very young children may get frightened. The exciting ending where you try to escape through dark tunnels and come face to face with huge and deadly creatures is especially nerve-wracking. However, exiting through the gift shop may prove difficult as most children will leave the experience more or less obsessed with dinosaurs! This is a wild virtual safari, an educational interactive research trip or the most spectacular immersive theatre you could imagine. Dinosaurs in the Wild is on the Greenwich Peninsula from 12 February - 2 September. Tickets start from £25 for adults and £22 for children age 3 and up. Family and group tickets are available.